Situated on the west coast of the Europe, Portugal is exposed to all sorts of swells from the Atlantic ocean. If you’re looking for something a little different for your next surf trip, and want a little European flair, then Portugal might be the place for you! Portugal does not immediately come to mind when thinking of dream surf destinations. But the secret is getting out, and Portugal is slowly rising as a premiere surf destination. There are points, sandbars, bays, and even a few big waves places such as the island of Maderia. Peniche has a number of different surf camps, catering to a wide range European travelers looking to take a surf holiday. My friend and I only met one other American during our stay, which was actually pretty fun. For this trip a friend an I stayed at the Peniche Surf Camp in Peniche. Peniche is a quiet fishing town situated on an island-like peninsula of land. This positions Peniche in such a way that you can always find a spot that’s offshore or out of the wind. The camp offers a wide range of services, from personal and group lessons, to video critique sessions, and evening barbeques and parties. 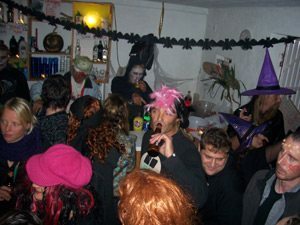 Since we went over Halloween, we got to experience a raving euro-type Halloween bash at the German surf camp. We met so many fun people from Portugal, Australia, Sweden, England, and many other places. Thanks to Facebook I’m still in touch with many of them. The instructors at the Peniche camp are excellent and experienced surfers who will help you on your technique and style. The video sessions are excellent – seeing yourself on video can really help you improve. There was also a professional photographer on hand so everyone got to come away with some great action shots. This camp was quite cheap even though the Euro was slamming the Dollar when we went. Some people might scoff at the idea of staying at a surf camp, but in my opinion surf travel is also about the people you meet, and staying at a camp you’ll make friends instantly. Perhaps most famous for “Supertubos” (Supertubes), there are a number of different breaks scattered around the town that offer a wide range of waves for beginners to more advanced surfers. Supertubes is a fast, hollow beachbreak that can break your board and your neck. This wave is for experienced surfers only. Molho Leste (Pronounced “Moy Lest”) is a fast right that runs along a jetty. It’s the next break over from Supertubes. It can break even when very small, offering a great place for beginners. But watch out…when this place breaks big it’s fast and powerful. On the other side of the peninsula we have Cantinho Da Baia and Meio Da Baia. Basically these are spots along a large bay on the northen side of Peniche. Depending on swell direction, the “Middle of the Bay” generally breaks bigger. “Corner of the Bay” can offer protection from the wind and smaller waves. When we were there we surfed Cantinho Da Baia a lot as it was more sheltered and the wave shape was better. Meio Da Baia has a few peaks and is just off a pile of offshore reefs/rocks. Meio Da Baia is where I had my worst wipeout ever. It packs a punch, but it can help you push your surfing limits. Further north along the coast is Lagido which is a left breaking over a reef, and then Almagreira and Belgas. Conditions did not permit surf on the last two breaks, and I didn’t get to surf Lagido because of a tweaked neck I sustained in the aforementioned wipeout at Meio Da Baia. Unfortunately we got a little skunked on our trip as Peniche was ransacked by heavy winds. 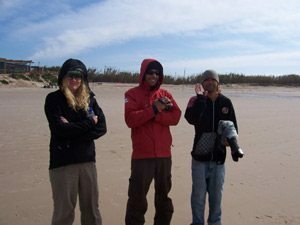 The weather we encountered was very unusual for the area, but we still surfed every day. Towards the end of our 10 day stay winds calmed and the weather got quite good, so we did get a taste of the “usual” Peniche. Bring your standard shortboard (or whatever is standard for you), and then depending on the swell, take a step up or small wave board. Check the swell forecast before you leave to see what kind of boards you might need. I was happy to have brought my fish for the last few days when the waves got small. I ended up getting the longest rides while everyone else was struggling on their thrusters. If you don’t have a board, or don’t feel like bringing it on the plane, rentals are easy to come across at the various camps and shops. As far as wetsuits go, you can get away with a 3/2 for much of the year, but in the Winter I definitely suggest bringing a 4/3 and throw your booties in the bag too. In the summer you can get away with just a swimsuit, but if you’re like me and get cold, I’d bring a light wetsuit top or a springsuit. Make sure you check out the local mom and pop cafes that are scattered around town. Our favorite thing to do in the morning was to go to the local cafe, have a Galão or two and a chocolate croissant, chat with the other surfers, and then hit the water. We took a day off to explore the countryside and went to the walled city of Obidos with Pedro, the surf camp photog. He introduced us to “Ginjina de Obidos,” which is a cherry liqueur, found in many shops, stands, and bars around the city. The best way to have it is poured from a large bottle into edible chocolate shot glasses. Another great place is the small town of Ferrel. The narrow streets, coffee shops and boutiques really make you feel like you’re in Europe. To the south, the nearby town of Ericeira offers a multitude of world class surf breaks. This is next on our list when we return to Portugal. Access to Peniche is an easy 45 minute drive from the main airport in Lisbon. You can choose your destination (such as Peniche), and your favorite accommodation type, as well as other services. Aloha! Peniche is known for its magnificent beaches and for being the capital of the wave. Supertubos Beach has one of the best waves in Europe. The pipeline is one of the most perfect and powerful of Europe. http://PenicheSurfersCity.com provides self-catering accommodation solutions and surf services in Peniche, Baleal and Consolação. Great surf in here, no doubt about it!!! Lots of waves around Peniche area… and I mean lots of them. 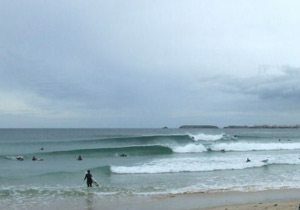 Definitely come during the Autumn-Winter season and book your surf holidays early. With some effort you’ll find great accommodation for less than 500 euros per week, in a comfortable, fully equipped front side apartment in Peniche, Baleal or Ferrel. Admins, if you need some local news or reviews, drop me an email. Hi, glad to hear you had a great time in Peniche, there are always great waves in the area somewhere. I actually moved here from Cornwall about a year ago and have found it to be the best decision i ever made.For those of you thinking to make the trip, i suggest Sept- Nov and March- May if u want to score the waves and July-aug if you wanna score with the babes. There is a lot of overpriced, low quality accomadation in the area and i would suggest to anyone making the trip to check out http://www.silvercoast-apartments.com. Great article! I’ve yet to go to Portugal but it’s definately on my list. Looking forward to hearing more.